Renowned pianist, conductor and teacher Leon Fleisher started piano lessons in his native San Francisco at age four, and gave his first recital at eight. A year later he began studying with the great German pianist Artur Schnabel, a fourth-generation Beethoven pupil, and by 16, in 1944, made his debut with the New York Philharmonic. He was the first American to win the prestigious Queen Elisabeth of Belgium competition, in 1952. Fleisher's career was on a smooth upward trajectory for the next dozen years: he concertized all over the world with every major orchestra and conductor, gave recitals, and made numerous touchstone recordings, including the piano concertos of Beethoven, Brahms, Grieg, Schumann, and Rachmaninov, with George Szell and the Cleveland Orchestra. Fleisher was suddenly struck silent when two fingers of his right hand became immobile in 1965. He was forced to "retire" when only 37 years old. This was the defining moment in his career until the late 1990's, when he began treatments that finally helped relieve the neurological affliction known as ‘focal dystonia.' Fleisher has been playing infrequently with both hands again, and in 2004 made his first two-hand recording in 40 years called Two Hands. 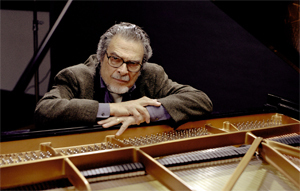 In the years since Leon Fleisher's keyboard career was so suddenly curtailed, he has followed two parallel careers - as conductor and teacher - while learning to play the extensive but limiting repertoire of compositions for piano left-hand. Mr. Fleisher's reputation as a conductor was quickly established when he founded the Theatre Chamber Players at the Kennedy Center in 1967 and became Music Director of the Annapolis Symphony in 1970. He has since appeared as guest conductor with the Cleveland Orchestra and the Symphony Orchestras of Boston, Chicago, San Francisco, Montreal, and Detroit, among others. He also had a regular association with the New Japan Philharmonic as its Principal Guest Conductor, as well as with the Chamber Orchestra of Europe and the Gustav Mahler Chamber Orchestra. Teaching has been a crucially important element in Leon Fleisher's life. As a revered pedagogue, he has held the Andrew W. Mellon Chair at the Peabody Conservatory of Music since 1959, and also serves on the faculties of the Curtis Institute of Music in Philadelphia and the Royal Conservatory of Music in Toronto. From 1986-97 he was Artistic Director of the Tanglewood Music Center. His teaching activities at the Aspen, Lucerne, Ravinia, and Verbier festivals have brought him in contact with students from all over the world. He has also given master classes at the Salzburg Mozarteum, the Paris Conservatory, the Ravel Academy at Saint-Jean-de-Luz, the Reina Sofia School in Madrid, the Mishkenot in Jerusalem, and the Metropolitan Museum of Art in New York.